Lions, turtles, and birds, oh my! Brooches have been worn throughout history to hold clothing in place, show support of a cause, and accessorize an ensemble. Recently pins, a less ornamental type of adornment, have gained popularity in fashion. Here, we look at vintage brooches featuring animals that are available in our Nine Caroline Antiques Etsy shop and can easily become a simple, modern fashion accessory. 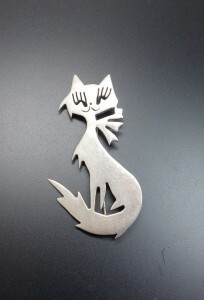 Serious attitude exudes from the pictured Vintage Sterling Silver Cat Brooch. The sharp edges, cut out eyelashes, and sweeping tail make this one unique feline! She even has a bow tied around her neck! The brooch is marked sterling silver and, based on the back stamp, was created in Taxco, Mexico, a city known for its silver products. A brooch for dog lovers would be the Vintage Sterling Silver Dachshund Brooch by Beaucraft Jewelry available in our Etsy shop. The design is very simple yet radiates happiness with the smile line and large eye. The back is stamped sterling silver and “BEAU”. Beaucraft Jewelry was founded in 1947 in Providence, Rhode Island and was a leading producer of fine sterling silver jewelry until their retirement in 2004. Currently, their work is sought after by collectors around the world. 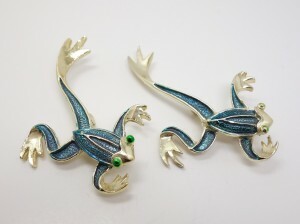 The pictured pair of vintage leaping tree frog brooches will make a fun accessory! The blue frogs with green eyes are poised for jumping. They are marked “Gerry’s” on the back for Gerry’s Creations, a company founded in 1950 when costume jewelry was at its height. Gerry’s continued to make a wide variety of brooches until they closed in 1996. This pair of frogs is a wonderful example of their craftsmanship. Maybe you’re a lover of reptiles? 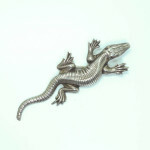 Fear not for we have a wonderful vintage sterling silver lizard brooch. This 1920s reptile marked “sterling” has such great detail that it will appear as if a 3” long lizard is crawling on your belongings! 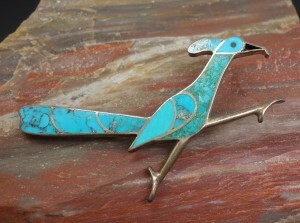 This eye catching roadrunner is a sterling silver brooch created by a Native American designer. It features beautiful turquoise and appears to be in motion. The roadrunner is sacred to the Pueblo tribes and, due to their speed and endurance, are said to have protective qualities that can ward off evils. The back is marked “sterling” and includes a maker’s hallmark that we, unfortunately, could not identify. Any of these brooches would make wonderful modern pins to accessorize a jacket, hat, or backpack. To view more of our brooches click here. Or visit the jewelry section of our ebay store for an even larger selection.